The Lego car looks fun and full of whimsy, sure, but like all Lego creations I can't help but feel it had a few extra, yet important pieces lying around when the builder finished. 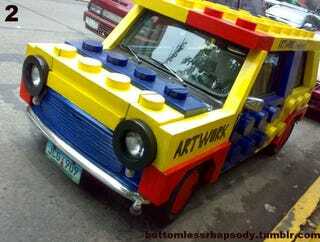 Apparently the car is the property of a tshirt store in the Philippines called Artwork. Beyond that, we know relatively little, aside from the car's obviously limitless customization options.